Jana Andolan Party president Harka Bahadur Chhetri today iterated that his party would fight the municipality elections in the hills on its own and that talks about an alliance with other parties were nothing but rumours spread by rival organisations. Chhetri said the JAP had from the very beginning clarified that it would contest the polls on its own. "Other parties have been spreading rumours that the JAP will go for an alliance with another party.... I want to make it very clear that the JAP will not fight the coming municipality elections in alliance with any other party," he said. The JAP president said his party had never had an alliance with any other organisation, be it the Gorkha Janmukti Morcha, Trinamul Congress, Gorkha National Liberation Front or the Akhil Bharatiya Gorkha league, and it would never have one in the future. "Other parties are spreading rumours in order to cover up for their sullied image or run down our image. But I would appeal to the people to pay no heed to them because the JAP will be fighting the elections on its own," he said. Elections to the Darjeeling, Kalimpong, Kurseong and Mirik civic bodies will be held on May 14. The filing of nomination will begin tomorrow and the results will be announced on May 17. The JAP is expected to put up a strong fight against the Morcha, particularly in its Kalimpong stronghold. In the last Assembly elections, the JAP had lead in 17 of the 23 municipality wards even though it lost the Kalimpong seat to the Morcha. Morcha president Bimal Gurung had been camping in Kalimpong for the better part of the last month and a half to ensure his party's victory in the civic polls. "Bimal Gurung has been camping here because the Morcha's very survival is under threat.... Its MP is not being able to raise the Gorkhaland issue. Will the Gorkhaland demand be raised in the municipalities?" he wondered. The Morcha has been accused of raising the bogey of Gorkhaland to garner votes during the elections by its rivals, including the JAP. 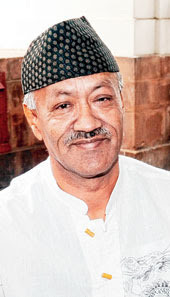 Chhetri said the Morcha was in power in all the four hill municipalities, but could deliver little during the past five years.